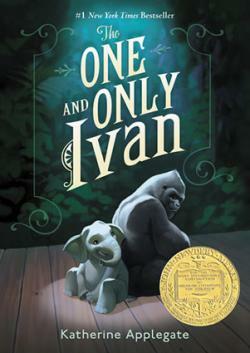 The One and Only Ivan, written by Katherine Applegate and illustrated by Patricia Castelao, is a fictional story about a real life silverback gorilla. This powerful yet gently told story won the Newbery Medal in 2013 for distinguished contribution to American children's literature. "Katherine Applegate gives readers a unique and unforgettable gorilla's-eye-view of the world that challenges the way we look at animals and at ourselves," said Newbery Medal Committee Chair Steven Engelfried. The book is best suited to children in grades three to five. Ivan was a real gorilla who was taken as a baby from the wild in Africa. When he became too big to be kept as a family pet, he was moved to a glass cage in a shopping mall. He lived there alone for 27 years before he was featured in a National Geographic documentary. The public, concerned about his lonely existence, demanded a better life for Ivan. He was featured in an article in the New York Times in 1993. The story captured the attention of children's author Katherine Applegate, though it would be around 20 years before the book was completed. When the shopping mall went bankrupt Ivan was moved to the Atlanta Zoo, where he lived for 17 happy years until his death at age 50 in 2012. Though Ivan is real, the story and most other characters are fictional. The book begins with Ivan, the giant silverback gorilla, living alone in a glass cage he calls his "domain," in a run down, circus-themed shopping mall. The billboard outside the mall shows a ferocious, roaring monster called "The One and Only Ivan" however the real Ivan is a gentle creature, accepting of his unusual situation in life. During the day, Ivan is stared at by mall visitors. At night, he spends time with his animal friends, Stella the wise, elderly elephant and Bob the streetwise, stray dog. Ivan belongs to the mall owner, Mack, whose main concern is keeping the visitors and the money coming in. At night, George the cleaner comes to work at the mall, with his young daughter Julia. Julia, a budding artist, brings Ivan crayons and spends her evenings teaching him to draw. Ivan never leaves his "domain" and Stella is becoming too old and sick to perform for the dwindling crowds. One day Mack brings home a new attraction to draw more visitors; a baby elephant called Ruby. Ruby becomes the family that Stella has always wanted. Stella spends her evenings telling stories to Ivan, Ruby and Bob. One night Stella tells a story about a gorilla called Jambo who lived in a zoo. "A good zoo," says Stella, "is a large domain. A wild cage... A good zoo is how humans make amends." Gradually, Stella helps Ivan to realize that his domain is a cage and that all animals, and especially baby Ruby, deserve a better life. Ivan thinks of a plan to help Ruby and works on it every night, but he needs the help of humans to make the plan work. "Humans can surprise you sometimes," Stella has told him. Ivan was a real life gorilla, as was Kinyani, who Ivan meets at the end of the story and Jambo who is in Stella's story. The real Ivan also liked to paint and sold his paintings. The author once tried to see the real Ivan. She flew to Atlanta and sat for hours in the rain but Ivan, who did not like wet weather did not come outside. The author could not believe she had won the Newbery medal. Her first book was a romance novel. 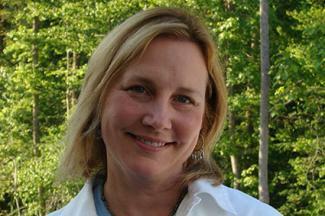 "I've got to believe I'm the first person to win the Newbery who has written a Harlequin romance!" she told Publishers Weekly. Ivan was so popular that when he died a memorial service was held and the author attended. The book allows for many opportunities to discuss current issues such as animal rights and environmental issues. For example, Ivan is happier in the zoo than in the shopping mall, but is this the best place for him? What about caring for the environment so animals can stay in the wild? There is the opportunity to talk about themes such as persistence, loyalty, friendship and optimism in tough situations. The book does address the issue of animal cruelty. While there is no explicit violence, the book alludes to inappropriate treatment of animals and threat of violence, such as with the presence of the sharp claw stick in the scenes where Ruby is trained to perform. This may distress some children. This book is well worth sharing with children who love and care about animals. To extend your child's interest in this theme there are many other books about wild animals you can explore together, as well as interesting gorilla facts to learn.